Spendthrift Spanish aristocrat Don Cesar de Bazan (Antonio Moreno) is unceremoniously thrown out of his countryside castle after the last of many extravagant parties leaves him bankrupt. 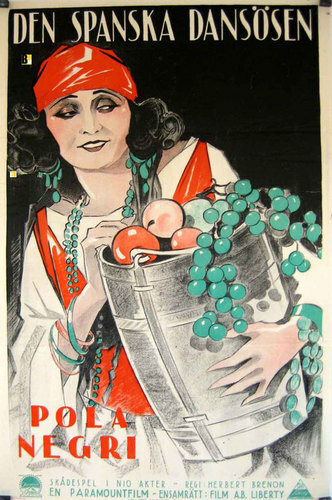 Helping this new exile is Maritana (Pola Negri), a tempestuous gypsy dancer who enflames his interest. She also attracts the wandering eye of King Philip IV (Wallace Beery) who makes a deal with her through his minister Don Salluste (Adolphe Menjou) that will enable him to keep her as his mistress on the quiet. After an exhaustive, international effort to reconstruct this saucy historical comedy, spearheaded by EYE (the Netherlands Film Institute) director Herbert Brenon’s star vehicle for new import Negri has been worthily remounted. Originally commissioned for Rudolph Valentino, contractual disputes between him and the newly created Paramount Studios saw him suspended. The project was given a gender-bending to suit Polish import Pola. Negri’s champion from her glory days in Germany, director Ernst Lubitsch, turned down the opportunity to direct her, choosing instead to pin his future career prospects on established blockbuster star Mary Pickford by making Rosita (1923). Both films were based on the same stage play but surprisingly, given this film’s sputtering start to life, it was Negri’s that went on to earn more at the box office. Despite several disparate prints around the world, all of varying length and quality, EYE were surprised to find after locating the original treatment script that what they assumed was a poor and fairly standard costume drama was actually a comedy. As today’s viewers can see, it is a very funny one too. Whether painter Velazquez valiantly tries to capture the King’s portrait with increasing desperation as the monarch’s concentration is increasingly interrupted, or when Moreno jokes about impending death after his nuptials or Beery’s merry monarch satirises his own insatiable lustings, the film is peppered with a bawdily sarcastic wit throughout. It is this scripting that makes The Spanish Dancer twirl on the graves of other mute epics of this type. Negri whose deep, penetrating eyes and sensual body were totally suited to playing the title role, is a confident lead. Now fully settled into the American motion picture machine in what was her fourth Hollywood film (all released within one year). Moreno, one of the handful of Latin Lovers performing in Tinsletown at this time, is a surprisingly versatile comic actor, turning from a naive rich fop to a committed husband with a deftly funny touch. Beery provides more of the giggles in what he must have realised was the most atrocious wig in cinematic history (a King with such a syrup? Never!). Mature Kathlyn Williams, a former Queen of the Serials (stories shown in episodes, popular during the First World War) provides the straight foil for Menjou to wield a menacing, Machiavellian influence as the sleaziest of behind the scenes operators. There are silly little scenes that can aggravate a reviewer (Moreno’s feast that was apparently the talk of the whole countryside seems more like a few plates of well-placed grapes, but the nearby village is really just a small hovel; the obviously Californian locations subbing for Spain) but these are in stark contract to awesome visuals (the Feast Day, with blossom raining down on hundreds of expertly arranged extras enjoying the revelry is a spectacular deployment from Brenon) that mark this out as a movie that hits the mark, by hook or crook, on several levels. Director: Herbert Brenon. Paramount/Famous Players-Lasky. Writers: Beulah Marie Dix, June Mathis. Pola Negri, Antonio Moreno, Wallace Beery, Kathlyn Williams, Adolphe Menjou, Gareth Hughes, Edward Kipling, Anne Shirley.